WASHINGTON (March 19, 2008) -- Five years ago, American forces marched into Iraq to liberate that nation. Today, President George W. Bush affirmed the decision was the right one. "Five years into this battle, there is an understandable debate over whether the war was worth fighting, whether the fight is worth winning, and whether we can win it," Bush told a gathering of military members at the Pentagon. "The answers are clear to me: Removing Saddam Hussein from power was the right decision -- and this is a fight America can and must win." 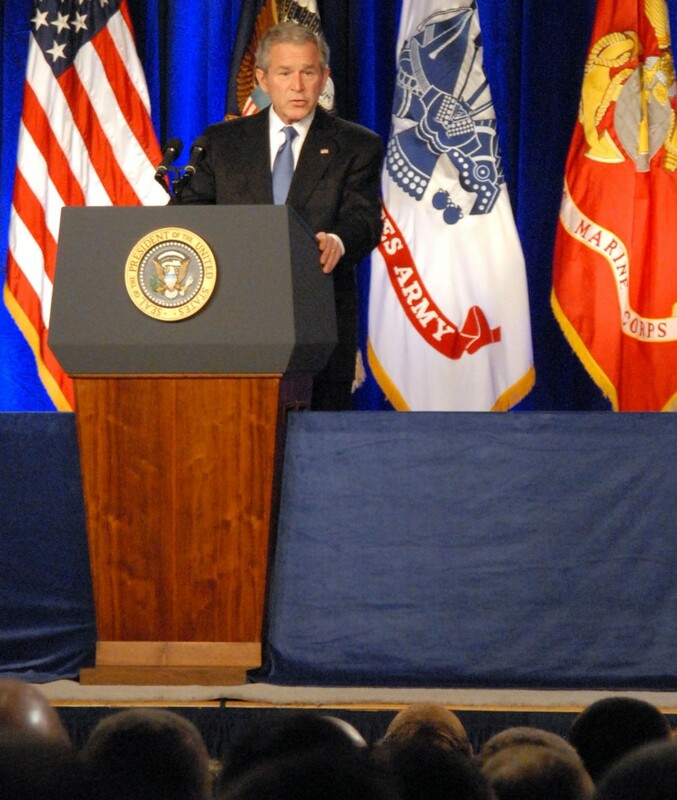 President George W. Bush speaks to a group of military members March 19 at the Pentagon, on the eve of the fifth anniversary of the start of the war in Iraq. The president also told the gathered military members that their contributions to the war efforts in Iraq have not gone unnoticed, and that he was in fact proud of their hard work and sacrifice in the country. "The men and women who crossed into Iraq five years ago removed a tyrant, liberated a country, and rescued millions from unspeakable horrors," Bush said. "Some of those troops are with us today, and you need to know that the American people are proud of your accomplishment -- and so is the commander in chief." The President told those gathered that once they had liberated the Iraqi people from the oppressive regime of Saddam Hussein, his soldiers retreated, took off their uniforms, and blended in with insurgents to help prevent the spread of freedom across Iraq. "Former regime elements took off their uniforms and faded into the countryside to fight the emergence of a free Iraq," he said. "They were joined by foreign terrorists who were seeking to stop the advance of liberty in the Middle East and seeking to establish safe havens from which to plot new attacks across the world." In spite of the efforts of former regime members and terrorists to prevent freedom from taking root in Iraq, American forces, aided by coalition partners, have helped the Iraqi people stake a claim in democracy, and have helped them recover from life under the dictatorial rule of Hussein. "And as they've battled the terrorists and extremists in Iraq, they have helped the Iraqi people reclaim their nation, and helped a young democracy rise from the rubble of Saddam Hussein's tyranny," Bush said. Next month, military leaders will come to Washington, D.C., to testify before lawmakers on Capitol Hill about the status of the war in Iraq. President Bush said only after those military leaders, the commanders, have made their recommendation, will he make decisions about the number of troops that should continue in Iraq. "Any further drawdown will be based on conditions on the ground and the recommendations of our commanders -- and they must not jeopardize the hard-fought gains our troops and civilians have made over the past year," he said. President Bush said that pulling out of Iraq too soon could allow terrorists to regain a foothold there, to build safe havens, and to strengthen their resolve to destroy freedom in Iraq, the United States and in other free nations. "If we were to allow our enemies to prevail in Iraq, the violence that is now declining would accelerate -- and Iraq would descend into chaos," he said. "Out of such chaos in Iraq, the terrorist movement could emerge emboldened -- with new recruits, new resources, and an even greater determination to dominate the region and harm America." In order to prevent terrorists from again taking root in Iraq, President Bush resolved to continue the fight and to continue to do what is necessary to ensure freedom in Iraq and to ensure that America stays safe. "Throughout the war on terror, we have fought the enemy on every single battlefront," he said. "And so long as the terrorist danger remains, the United States of America will continue to fight the enemy wherever it makes its stand."